So there are these things called quarks. (I know, I wish they had a better name, but I'm not in charge of naming things in physics.) Quarks are little teensy tiny particles (we'll get to exactly how small in a bit) that are fundamental building blocks of matter. As far as we can tell, quarks themselves are not made of anything smaller. That may change in the future as we learn more, but it's good enough for now. By far, the most common quarks you'll encounter are the up and down ones. They're the ones that bundle together in triplets to form protons (two ups and a down) and neutrons (two downs and an up). To form the familiar positive charge of the proton and the neutral charge on the neutron, the quarks need fractional charges. 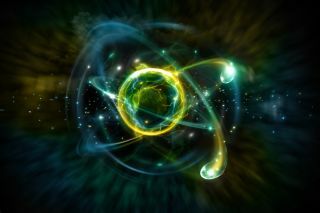 I know, that sounds weird, but that's only because we thought that the charge of protons and electrons was fundamental. Turns out, we were wrong. The up quark has a charge of plus two-thirds, while the down quark is sitting at minus one-third. What's even more confusing about the quarks is that they're surprisingly light. The up quark is a mere 0.2 percent the mass of the proton, while its partner the down quark is only around 0.5 percent of the proton mass. So how can these measly particles add up to the mass of a hefty proton? The answer is the force that binds quarks together: the strong nuclear force. This binding among the quarks is blaringly strong — handily defeating the natural electric repulsion of the similarly charged quarks. And since energy is the same thing as mass (thanks, Einstein! ), the mass of the proton is really due to the glue, and not the quarks themselves. That means life is just peachy for the up and down quarks. They're the smallest; so while they don't have great views, they're not in any danger of falling off an existential cliff. The next largest quarks, strange and charm, are rarely found in any great abundance in nature. They're so massive that they're hard to make in the first place, and as soon as they're manufactured by some exotic process, they quickly decay into something else, leaving behind nothing more than a memory. For quite a while, physicists thought there were only these four quarks — up, down, strange and charm. But in the early 1970s, they started to suspect otherwise by examining some rare decays involving kaons (and again, I'm not in charge of naming things. The kaon is a duo of a strange quark and either an up or a down quark). In order to explain the weird decay that produced these kaons, theorists had to guess at the existence of a new pair of quarks, which they dubbed the top and bottom. These new quarks were much, much heavier than the other four (otherwise we would've seen them by now). Once quark No. 5 (the bottom) joined the club of known-and-measured particles in 1977, the race was on to find the sixth and final one (the top). But the problem was that nobody had any idea how big it was, meaning we didn't know how beefier we had to make our particle accelerators before we could pop one out. Every year, groups around the world upgraded their gear, and every year they came up short, pushing the mass of the then-hypothetical particle ever upward. It wasn't until February 1995 that researchers at Fermilab could finally stake a claim to a discovery of a top quark with a mass tipping the scales at almost 200 times heavier than a proton. That's right: While the up and down quarks barely do any of the work of making a proton a proton, the top quark can easily body- slam entire atoms with ease. The top quark is about 100 trillion times heavier than the up quark. That's nice. But why? Why do the quarks have such an immense range in masses? This is where the Higgs boson comes in. The Higgs boson is associated with a field (the Higgs field, kind of like the electromagnetic field) that permeates all of space-time, like an invisible glue filling the universe. Other fundamental particles, like electrons and neutrinos and quarks, must swim through this field to go from place to place. The very fact that the fundamental particles can't ignore the Higgs field is (through various and sundry mathematics) the very reason they have mass. Ah, a clue, then. If the Higgs is somehow connected to the very concept of mass, and the top quark is far and away the heaviest of the quarks, then the Higgs boson and the top quark must be best of friends. And so over the years, the top quark became one gateway to our understanding of the Higgs, and it's hoped that with further study of the Higgs itself we can get some perspectives on the mysteriously large mass of the top quark.